Curicó (kureko') meaning ‘Land of Black Water’ is located 200kms south of Santiago in the Maule region of Chile’s central valley. Winegrowing has been the primary industry here since the famous Spanish producer Miguel Torres began his New World operation here in the 1970s. Vines have been planted here since the 1800s though and it has huge diversity with more than 30 varieties. Despite being not far from the Pacific, the Coastal range blocks the maritime influence and gives the region a continental climate with large differences between the day and night temperatures - very beneficial for flavour and aroma. 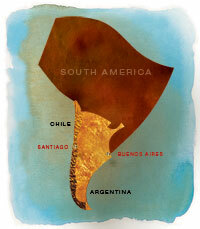 This is Chile’s largest area of Sauvignon Blanc production, as well as being home to many a broad shouldered red.